The Narratives of the trial of Jesis of Nazareth in Jerusalem, reocded primarily in the Gospels of Matthew, Mark, Luke and John, contain a plethora of historical claims about people, places, and events that can be evaluated for accuracy through an analysis of archaeological data and ancient texts (Matthew 26:57–68, 27:11–26; Mark 14:53–65, 15:1–15; Luke 22:66–23:25; John 18:12–19:16). The story of the trial is not written as myth; rather, it contains a precise time line embedded in historical locations, figures and events which can be compared to ancient historical records and archaeological discoveries. The narrative of the trial contains four prominent figures, three key locations and the decision to crucify Jesus. Set in first century Jerusalem between AD 30–33,1 Jesus is arrested one night and eventually brought before the chief priests and scribes—most notably the acting High Priest of the time named Caiaphas (High Priest ca. AD 18–36). After accusing Him of blasphemy, He is taken to Pontius Pilate (Prefect ca. AD 26–36), the local Roman official presiding directly over Judaea Province at the time. Pilate initially finds no guilt, and after discovering that Jesus was from Galilee, Pilate sends him to Herod Antipas, the Tetrarch of Galilee (Tetrarch ca. 4 BC– AD 39). Following a mocking, Herod Antipas sends Jesus back to Pilate who finally gives into the demands of the Jewish leadership to crucify Jesus. The high priest Caiaphas, the tetrarch Herod Antipas, the prefect Pontius Pilate and the defendant Jesus of Nazareth are the most prominent figures in this narrative. Consequently, all of these characters are attested outside of the New Testament by archaeological artefacts and ancient texts. The meeting place of the Sanhedrin (or Jewish council), the Praetorium of Pilate and the house of Caiaphas are the three key locations of the trial narrative. These were real locations in the first century AD, and while debate exists about their exact locations, at least two and perhaps all three have probably been discovered and are partially visible today. Finally, the decision to crucify Jesus is not only recorded in the New Testament, but by historians of the first and second centuries AD. After being brought before Annas, the first of these prominent figures that Jesus appears before is Caiaphas at his own residence (Luke 22:66; Matthew 26:57; John 18:24). Joseph son of Caiaphas was the full name of this High Priest according to ancient sources (Antiquities, 18.34–35). While there is a traditional “House of Caiaphas” located in the southwest area of ancient Jerusalem, no evidence exists to suggest it is the actual house of Caiaphas. However, another archaeological site in which elaborate remains of what appears to be a priestly mansion from the first century AD—including ritual baths, completely preserved base- ment rooms and ritual artefacts associated with priestly functions—continues to be excavated (Gibson 2010: 35–41).2 Additionally, excavations in the Jewish Quarter of Old City Jerusalem, also referred to as the “Herodian Quarter,” revealed multiple houses and a massive elite residence from the first century AD that provides a glimpse of how the house of Caiaphas may have looked at the time of the trial of Jesus (Geva 2000). Caiaphas, according to the trial narrative in the Gospels, was the high priest at the time. The office of high priest was originally held for life, but in the Roman period this was no longer the practice—Josephus records appointment and removal of high priests by Roman officials and Caiaphas was no longer the acting high priest by the time Peter and John were arrested (Numbers 35:25–28; Antiquities, 18.34–35; Curran 2005: 84). Caiaphus is attested in the writings of Josephus as being installed and removed as high priest, which places the events of the trial of Jesus in his 18 to 36 AD period as acting high priest (Antiquities, 18.34–35, 18.95; Curran 2005: 84). An important historical source regarding the trial of Jesus, the writings of Josephus cor- roborate the name, position, and time of service for the high priest Joseph Caiaphas. Rather than conflicting with the Gospels or the book of Acts, the account of Josephus actually explains why there appears to be multiple high priests at the same time during the trial of Jesus. Outside of the writings of Josephus, Joseph Caiaphas is also attested archaeologically by an inscription carved on an ossuary found outside the walls of first century Jerusalem. In 1990, the family tomb of Caiaphas was discovered, and salvage excavations were carried out (Greenhut 1992a: 63–71). A total of 12 ossuaries were found inside the tomb, but more importantly, two of these were inscribed with the family name Caiaphas and one particularly ornate ossuary was inscribed “Joseph, son of Caiaphas” (Greenhut 1992b: 28–33). This particular ossuary bears an inscription in Aramaic as Yehosef bar Qayafa, which fits the New Testament spelling of the family name Kaiafa perfectly (Reich 1992: 41–44). The name on the ossuary is a match, but additional evidence for the ossuary being that of the infamous Joseph Caiaphus comes from the date, location, intricate carving and skeletal remains. Sometime in the middle of the reign of Herod I (374 BC), ossuaries appeared in rock cut tombs around Jerusalem, but disappear by about AD 70 and the Roman destruction (Magness 2005: 129). A coin of Herod Agrippa I dated to AD 42/43 was discovered in a skull resting in one of the other ossuaries of the tomb narrowed the date to the first century (Wolff 1993: 152). Ossuaries from this period may range vastly in their decoration and inscriptions, and while highly decorative ossuaries do indicate a person of wealth and prominence, a plain ossuary does not necessarily indicate a person of lower social or financial standing (Magness 2005: 130). Although the actual inscription of Joseph, son of Caiaphas, is somewhat crude, this is not necessarily indicative of a poor or unimportant citizen. Rather, this indicates that the inscriber awkwardly wrote out the name for identification of the deceased with an iron nail after the ossuary had already been put on the shelf (Greenhut 1992b: 76; Reich 1992: 42–44). Finally, inside this intricate and inscribed ossuary, the remains of six individuals were discovered—significantly, perhaps, one set of skeletal remains was from a man about 60 years old (Peleg 2002: 68; Greenhut 1992b: 34). Thus, the archaeological and textual data demonstrate that the high priest, Joseph Caiaphas, who played a key role in the condemnation of Jesus Christ, was not only a real person and a prominent person in first century Jerusalem, but that he was the high priest during the trial of Jesus. Once Jesus finished His interrogations by Annas and Caiaphas, He was led to the Sanhedrin after sunrise. This council, or the Sanhedrin as it is sometimes known, may have been meeting in a building on the Temple Mount in the year AD 30 (Talmud Shabbat 15a). Although the exact location of this building is speculative, there are areas on the southern side of the Temple Mount that could have accommodated the meeting place and reconstructions often place the building in this location. After a brief encounter with Pilate, Jesus is taken to Herod Antipas, a Judean ruler (Luke 23:8–12). Herod Antipas, named as one of the tetrarchs after the death of Herod I, is known from coins, the writings of Josephus and an allusion in the writings of Philo. A tetrarch was a title for one of four rulers over a country or region and this was the title that Herod Antipas received after the death of Herod I in ca. 4 BC, when Herod Antipas received Galilee and Perea (Chancey & Porter 2001: 178; Luke 3:1). Jesus was taken to this particular ruler because Herod Antipas presided over Galilee and Jesus was from Galilee. Coins from the reign of Herod Antipas even bear his name and his title of “tetrarch,” demonstrating the historical nature of this prominent figure and supporting the claims made about him in the Gospel of Luke (Kanael 1963: 50-51). In the writings of Josephus, where he is called Antipas, he is also named as the tetrarch of Galilee and named as the one who ordered the execution of John the Baptizer (Antiquities, 18.111–137). Philo, although not mentioning him by name, alludes to Herod Antipas in passing as one of the tetrarch sons of king Herod who were in power over various regions of Judaea Province during the time of Pontius Pilate (Legatio ad Gaium, 300). Thus, Herod Antipas is firmly attested as a local ruler of Galilee during the rule of Pilate and his short involvement in the trial of Jesus is perfectly logical. Pontius Pilatus is perhaps the most famous of the three leaders involved in the trial. He is mentioned by numerous sources outside of the New Testament, had coins minted, and commissioned a monumental inscription that survived the ages. Philo mentions Pilate and some golden shields he put up in Jerusalem, angering the Jews (Legatio ad Gaium, 299). Tacitus mentions Pilate as procurator of Judaea in the reign of Tiberias (Annals 15.44). Josephus also mentions Pilate as a procurator sent to Judaea by Tiberias (Antiquities, 18.55; War 2.169). Although both of these historians call Pilate a procurator, his title was actually prefect. Pilate is also attested by coins that he had minted, although his name was not imprinted upon the coins, but instead the names Tiberias Caesar or Julia Caesar appeared. Interestingly, coins from the reign of Pilate exhibited pagan symbols, unlike most other rulers of the time in Judaea Province and may have been done because Pilate wanted to conform Jews to Roman culture (Kanael 1963: 53–55). The third category of evidence that affirms Pontius Pilate as an historical figure and the Roman official who would have presided over the trial of Jesus is an inscription commissioned by Pilate himself. At Caesarea Maritima on the coast of Israel, an inscription that mentions Pilate was discovered during excavations in 1961 on a block of limestone in secondary use in the steps of the Roman theatre. The inscription, partially obscured, dates to the first century AD and includes this important name and title: Pontius Pilatus, Prefect of Judea (Vardaman 1962: 70). Rulers of Judaea Province before AD 44, when Herod Agrippa died and direct rule by Rome was reinstituted, were of prefect rank, while those who ruled from AD 44 after Cuspius Fadus were of procurator rank (Curran 2005: 88; Josephus, War 2.111, Antiquities, 17.342; Roman History, 55.27). This particular inscription from the reign of Pilate demonstrates that Pontius Pilate not only existed, but was the prefect of Judaea Province during the reign of Tiberius Caesar and the trial of Jesus of Nazareth. According to a variety of historical synchronisms, Pilate presided over Judaea Province from ca. AD 26 to 36, conclusively placing him in the position to preside over the trial of Jesus no matter which date is preferred in the period AD 30–33. Therefore when Pilate heard this statement, he was even more afraid; and he entered into the Praetorium again and said to Jesus, “Where are You from?” But Jesus gave him no answer. So Pilate said to Him, “You do not speak to me? Do You not know that I have authority to release You, and I have authority to crucify You?” Jesus answered, “You would have no authority over Me, unless it had been given you from above; for this reason he who delivered Me to you has the greater sin.” As a result of this Pilate made efforts to release Him, but the Jews cried out saying, “If you release this Man, you are no friend of Caesar; everyone who makes himself out to be a king opposes Caesar.” Therefore, when Pilate heard these words, he brought Jesus out, and sat down on the judgment seat at a place called The Pavement (John 19:8–13, NASB). We know from earlier in the narrative that this trial occurred in Jerusalem, but John specifically mentions the “Praetorium,” the “judgment seat,” and “The Pavement.” The Praetorium was the residence of the Roman prefect of Judea Province, who at this time was Pontius Pilate. This structure received its name from earlier Roman usage, referring to the place where a commander resided. During the New Testament period, the word was used for the residence of a Roman governor over a province, such as Pilate as a prefect over Judea Province. 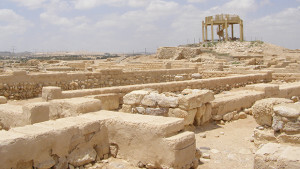 This specific governor’s residence or Praetorium, is believed by some archaeologists to be the former palace of Herod the Great, located on the western side of the current Old City of Jerusalem at the walls (Gibson 2009: 99-105; Legatio ad Gaium; Wars). Some of this area has been excavated in recent decades, but most of the remains from the Roman period were probably destroyed in later conquests and construction. The judgment seat, or Greek bema, is also mentioned. The bema was a raised platform and in its basic sense means “step,” although it is often translated as “judgment seat” in the New Testament. A more precise translation referring to its specific form and function is tribunal or judicial “bench.” It originated in Greece, used by both orators and law courts, but it was later adopted around the Roman world. 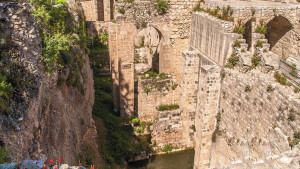 The bema at the Praetorium in Jerusalem was also discovered just outside of the Old City wall in Jerusalem during excavations and can be seen at the site of the Praetorium courtyard next to the stone pavement. The Pavement, or Greek lithostrotos, is a place paved with flat blocks of stone, like a street or courtyard. Part of the lithostrotos from the courtyard of the Praetorium in Jerusalem is still preserved after being covered by dirt and debris for centuries and can be seen today. Thus, we have both specific archaeological and textual confirmation of the trial of Jesus before Pilate in the Praetorium, as recorded in the Gospels. Jesus is the obvious central figure in the trial narratives. It is sometimes claimed that there is no evidence outside of the New Testament for Jesus as an historical figure, but the facts are quite the opposite. Jesus of Nazareth is actually mentioned by multiple historians of the first and second centuries and may even be attested by an inscription on an ossuary. Josephus, a prime historical source for first century Judaea Province, records that Jesus was condemned by Pilate to be crucified (Antiquities, 18:63, 64).3 Tacitus, a famous Roman historian of the early second century, wrote that Christ (the title for Jesus) was put to death by Pontius Pilate in Judaea during the reign of Tiberias (Annals, 15:44). According to quotations found in the writings of Origen, a late second century philosopher and outspoken opponent of Christianity named Celsus wrote that Jesus learned magic to perform miracles in Egypt, invented the virgin birth story and returned to Judaea and proclaimed himself a god (Contra Celsum, 1.28). Even the Babylonian Talmud may contain an early Jewish record about Jesus of Nazareth. There is record of an indictment against Jesus the Nazarene that prescribed stoning for his practice of sorcery and leading Israel into apostasy, requested that anyone with information on his location tell the Sanhedrin in Jerusalem and that he was hanged on the eve of Passover (Tracate Sanhedrin 43a). In addition to these and other historical texts, a first century ossuary may also mention Jesus as the brother of the deceased. The “James Ossuary,” as it is known, has an Aramaic inscription on the side that reads “James, son of Joseph, brother of Jesus,” and may be referring to Jesus of Nazareth whose father was Joseph and had a famous brother and Jerusalem church leader named James (Lemaire 2002: 24–33)4 This ossuary inscription, though controversial, could be the only known surviving artefact from the first century which demonstrates that Jesus was an historical figure at the time and prominent enough to be mentioned as a brother on an ossuary. The aforementioned ancient texts and archaeological materials demonstrate that the narratives of the trial of Jesus in the Gospels mention real historical figures and real historical locations from the first century AD involved in the trial of Jesus. Further, the condemnation of Jesus under Pontius Pilate is corroborated by historical texts outside of the New Testament. Although this is only a sampling of the evidence associated with the trial of Jesus, several key claims of the story have been substantiated. 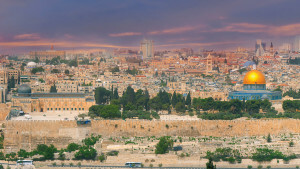 Thus, because of the level of historical and archaeological corroboration, the record of the trial of Jesus found in the Gospels can be considered an accurate history of events in Jerusalem around AD 30–33. While scholarship currently leans toward AD 33, dates within the range of AD 30–33 have been suggested and a consensus within academia has not yet been reached. The author prefers an AD 33 date, while the publishers of Archaeological Diggings date the crucifixion to AD 31. S Gibson, “New excavations on Mount Zion in Jerusalem and an inscribed stone cup/mug from the Second Temple Period”, in D Amit, O Peleg-Barkat and G Stiebel (eds). New studies in the archaeology of Jerusalem and its region: Collected papers volume IV (Jerusalem: IAA, Hebrew University, Moriah, 2010), pp 32–43. The author has been a supervisor on this excavation. Discoveries attest to the presence of an elaborate residence occupied by a priestly family. While it is unknown who lived in this house, it provides an example of the type of house Caiaphas might have lived in. It is within the realm of possibility that it was the house of Caiaphas or Annas. H Geva, Jewish quarter excavations in the old city of Jerusalem, vol 1: Architecture and stratigraphy (Jerusalem: Israel Exploration Society, 2000). Josephus, Antiquities 18.34, 35; J Curran, “ ‘The long hesitation’: Some reflections on the Romans in Judaea,” Greece & Rome, second series, vol 52, no 1 (2005), p 84. Josephus, Antiquities, 18.34, 35, 18.95; Curran, 2005, p 84. Z Greenhut, “The ‘Caiaphas’ tomb in North Talpiyot. Jerusalem,” ’Atiqot, vol 21 (1992), pp 63–71. Z Greenhut, “Burial cave of the Caiaphas family,” Biblical Archaeology Review, vol 18, no 5 (1992), pp 28–33. R Reich, “Caiaphas name inscribed on bone boxes,” Biblical Archaeology Review, vol 18, no 5 (1992), pp 41–44. J Magness, “Ossuaries and the burials of Jesus and James,” Journal of Biblical Literature, vol 124, no 1 (2005), p 129. S Wolff, “Archaeology in Israel,” American Journal of Archaeology, vol 97, no 1 (1993), p 152. Greenhut, “Burial cave of the Caiaphas family,” p 76; Reich, 1992, p 42–44. Y Peleg, “Gender and ossuaries: Ideology and meaning,” Bulletin of the Amercan Schools or Oriental Research, no 325 (2002), p 68; Greenhut, “Burial cave of the Caiaphas family,” p 34. M Chancey and A Porter, “The archaeology of Roman Palestine,” Near Eastern Archaeology, vol. 64, no 4 (2001), p 178. B Kanael, “Ancient Jewish coins and their historical importance,” The Biblical Archaeologist, vol 26, no 2 (1963), pp 50, 51. Philo, Legatio ad Gaium, 300. Philo, Legatio ad Gaium, 299. 23 Josephus, Antiquities 18.55 and War 2.169. J Vardaman, “A new inscription whichnmentions Pilate as ‘prefect’, ” Journal of Biblical Literature, vol 81 (1962), p 70. Curran, 2005, p 88; Josephus, War 2.111, Antiquities 17.342; Cassius Dio, Roman History, 55.27. H Liddell, R Scott, H Jones, and R McKenzie, A Greek-English Lexicon (Oxford: Clarendon, 1996) 763, 142. S Gibson, The final days of Jesus: The archaeological evidence (New York: HarperOne, 2009) pp 99–105; Tacitus, Legatio ad Gaium; Josephus, Wars. A Lemaire, “Burial box of James the brother of Jesus,” Biblical Archaeology Review, vol 28 (2002), pp 24–33. Josephus, Life of Flavius Josephus, 75. M Caba, “Crucifixion: History and practice,” Archaeological Diggings, June/July 2014, pp 15–19. N Haas, “Anthropological observations on the skeletal remains from Giv’at ha-Mivtar,” Israel Exploration Journal, vol 20 (1970), pp 56–58. Y Yadin, “Epigraphy and crucifixion,” Israel Exploration Journal, vol 23 (1973), pp 20–22; J Zias and E Sekeles, “The crucified man from Giv’at ha-Mivtar: A reappraisal,” Israel Exploration Journal, vol 35 (1985), pp 22–27. This crucifixion victim and the results of analysis are not yet published, but are currently undergoing additional study and will be published in a forthcoming volume. The Greek word translated as “hand” in many Bibles also includes the wrist and at least part of the forearm.